Gorgeous Home for sale in Siloam Springs on 60+/- acres. This amazing property is convenient to all of Northwest Arkansas and is a very private and beautiful piece of property and the home is GORGEOUS! 17101 Old HWY 68 in Siloam Springs, AR FOR SALE! Home is 4100 ht.sq.ft. with 5 bedrooms and 3.5 baths with a 3-car garage built in 2000. Home is set on 59.7 beautiful acres with trees and wildlife galore!!! If privacy is what you are looking for - THIS IS IT! The main level features a large open living room with floor to ceiling windows, gorgeous chef's kitchen with poured concrete counter-tops (if you have not seen these - you need to - they are spectacular!) - a nice hearth area (or large breakfast nook) - Formal Dining Room, Powder Room, Master Suite and bath & a mother-in-law SUITE - and when I say SUITE - I mean SWEET! - Comes complete with a Living Area and patio, kitchenette, separate bedroom and full bath!!! The upstairs has a large landing area perfect for office or play area - or just a nice reading nook. 2 large bedrooms and a full bath! IF PERFECTION is what you are looking for... Look no further - CALL ME TODAY! Home is shown by appointment only - no sign on property. 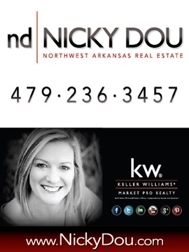 Call Nicky Dou @ 479-236-3457.